MSP case study: SOW talent procurement provides big-picture advantages. Home » managed services programs (MSP) » MSP case study: SOW talent procurement provides big-picture advantages. Randstad Sourceright was already providing a comprehensive managed services program (MSP) for a global technology client. The company’s MSP-controlled staff augmentation encompasses several thousand temporary and contingent workers including leading-edge technology professionals, sales, marketing and other business roles. Expanding its MSP program to include the seamless addition of statement of work (SOW) talent acquisition and onboarding — which represents more than $250 million in spend alone — the client is enjoying a single integrated solution that delivers higher levels of program governance, internal controls, strategic advantages, centralized process efficiencies and opportunities for cost savings. More accurate project monitoring and data reporting enhance project-worker fit, while RFP response review and support services allow procurement to easily identify preferred SOW vendors. Management of the RFP process streamlines competitive bidding, and centralized supplier payments enable better project spend monitoring. Through a proactively managed SOW process, line managers are able to collaborate more closely in building SOW talent requirements. This improves transparency of supplier expectations and helps build effective client-vendor relationships. With closer interaction between the client and SOW suppliers, and the ability to pre-identify preferred vendors, projects can be awarded more quickly. Managing the full onboarding of SOW talent means better vetting and more accurate worker classification. This helps mitigate compliance risks and adds to corporate security through proper talent badging and similar measures. Seeking an integrated talent sourcing model to manage both staff augmentation (temp and contingent talent) and SOW workers, the client saw an opportunity to expand its existing MSP talent model. Previously, SOW talent acquisition was decentralized, largely controlled by the individual business units or departments who utilized the workers. Without standardization and internal controls, former processes made it difficult to evaluate supplier performance and ensure the technology leader was getting the best talent at the best price. The company’s talent leaders also hoped to enhance worker tracking capabilities, and project and talent reporting for individual SOW spends, to avoid leaving possible cost savings on the table. Since the initial MSP implementation, Randstad Sourceright and the client have continuously worked together to evolve the company’s contingent workforce model. Through ongoing innovation, the program is enhancing client satisfaction, providing added visibility, and maximizing efficiencies that have led to greater optimization. Seamlessly managing SOW staff augmentation services under the MSP, Randstad Sourceright helps the client operate more strategically from a talent procurement standpoint. on-site Randstad Sourceright SOW specialist, who was already familiar with the client’s complex talent ecosystem, the expanded solution was quickly made operational. In year two of the SOW program, greater savings organically materialized through the MSP’s involvement during SOW extensions. During this time, Randstad Sourceright also determined ways to further enhance adoption and compliance. Now, Randstad Sourceright continues to find opportunities for cost savings at all stages of SOW management, and is driving additional value through the selection of suppliers, redeploying SOW solutions/resources across the client enterprise, and continuously improving timeliness, quality and compliance. With on-site SOW workers added to the company’s managed talent mix, the client is able to exercise the same rigor of process control, program governance and tail spend oversight that is applied to its broader contingent talent model. Management of the SOW program is now centralized, unburdening individual project managers. Through an advanced MSP talent model that manages SOW talent procurement, Randstad Sourceright team is not only expertly managing suppliers, solutions and resources, but serving as a trusted consultant and strategic advisor. With this holistic approach, the client is experiencing better quality suppliers and workers, process efficiency and transparency, program management, compliance, cost savings, and the ability to implement talent strategies that positively affect competitive advantage. MSP series: how to work with your managed services provider for the best results. Dois-je internaliser ou externaliser mes recrutements ? Internaliser ou externaliser mes recrutements, avantages et inconvénients des solutions RPO et MSP. MSP case study: market insights help beverage company attract contingent talent. How can market insights help you improve contingent workforce management? Find out what adjustments this beverage company made to reduce turnover and attract talent. talent trailblazer tv: elevating contingent workforce strategy with MSP. What are the benefits of MSP and how can you use contingent workforce strategy to drive your business forward? MSP case study: insurance leader scores A+ results with advanced talent supplier grading system. Find out how grading and managing your contingent talent suppliers can deliver faster access to talent and highly satisfied hiring managers. Q&A: creating an effective supplier management strategy. MSP expert, Twan Peters, gives you tips on how to create a strategic supplier management and reach your cost-saving goals. Spend Matters: Randstad Sourceright launches MSP Ahead. Contingent workforce management isn’t just about compliance and cost savings anymore. Learn about MSP Ahead. Hunt Scanlon: Randstad Sourceright creates new model of total talent management. What is MSP Ahead and how can it help you beat talent scarcity with your contingent workforce management strategy? Find out here. MSP case study: engineering company improves supply chain management. Read this case study to learn why global engineering company turns to a managed service provider to optimize flexible talent. Randstad Sourceright in 90 seconds. With expertise in recruitment process outsourcing (RPO), managed services programs (MSP) and total talent solutions, we have all your talent needs covered. 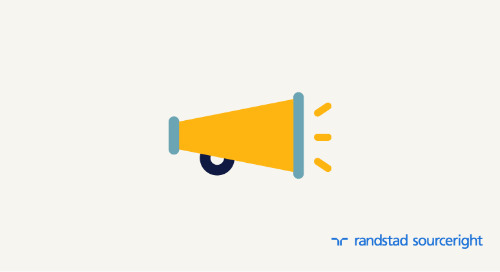 Randstad Sourceright announces new model of total talent management. Randstad Sourceright today unveiled the latest evolution of its managed service provider (MSP) offerings aimed at helping organizations manage today’s complex contingent workforce. MSP-Serie 4: Wie Sie mit Ihrem MSP zu den besten Ergebnissen kommen? MSP-Serie 5: Sind Sie bereit, Ihr Managed Services-Programm auszuweiten? MSP-Serie 2: 8 Vorteile von MSPs über Kosteneinsparungen hinaus. managing service provider spend: a practical approach to SOW talent management. Why should you integrate SOW talent management into you managed services program (MSP)? Read on for four benefits and tips for getting started.